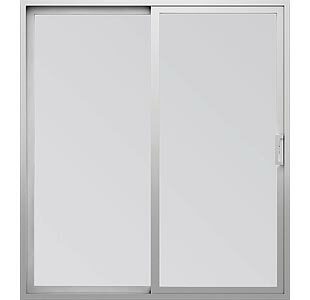 A contemporary vinyl patio door with a frame profile so narrow, you’ll hardly know it’s there. A sleek and contemporary vinyl patio door. If you are looking for a vinyl patio door with a contemporary feeling, our new Trinsic Series is for you. The sleek style is the perfect way to create a modern look for your home and the maximum available viewable glass area can help highlight amazing views. We produce our own vinyl formula for the Trinsic Series patio door. The durable frames will not absorb moisture and do not require painting. Talk to your Milgard Certified dealer about ENERGY STAR® requirements in your area when you select one of our energy package options. Trinsic Series sliding patio doors some with a newly designed, squared off handle. This crisp, clean, contemporary look offers a very modern flair. Consider the optional upgrade for an even narrower handle that blends seamlessly into the frame. We’re proud of the signature vinyl formula we use across our vinyl line. We also extrude our own frame materials and fabricate them in house for a quality patio door that meets our high standards, and yours. Trinsic Series patio doors come with a Full Lifetime Warranty. We will repair or replace any defect in materials or workmanship and will pay the costs of all parts and labor for as long as you own your home. This extends 10 years from the start date, if you sell your home. Glass Breakage is an optional upgrade. 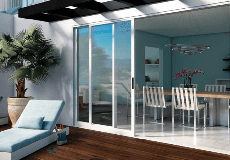 Trinsic Series sliding vinyl patio doors are the perfect complement to Trinsic Series windows. They are designed with a narrow frame profile that can help expand your view. Choose from 2, 3 and 4 panel options. Trinsic™ Series Patio Door is rated 4.3 out of 5 by 47.